Well, here I am once again sitting at thirty thousand feet in the air reading (or having just read) another Mr Men book. Okay, there are probably a lot of other things that I could be doing than reading a Mr Men book, such as watching season six of Game of Thrones (they have the first three episodes which I have yet to see), but I do have this urge to read another Mr Men book, and write a review while I am still on the plane (despite the fact that I won't be posting it until I have my feet firmly planted back on the ground, not that you can't get internet up here, it is just that I'm not really all that willing to fork out the $21.50 for access – anyway I get enough of the internet on the ground so I don't need to have it in the air as well). Anyway, this book is about a guy that happens to be a bit of a sticky beak. Actually, that is an understatement – he is a lot of a sticky beak, to the point that he will open other people's letters and read other people's newspapers while they are reading them. Actually, it is difficult not reading other people's newspapers at times, especially when you see an interesting article on the front page (though the front page is probably the most sensationalist part of the newspaper, which tends to be a pretty sensationalist medium as it is). As for opening other letters, well that is illegal, not that people get letters any more, unless, of course, they are bills (and even then they are sent by email). Which makes me wonder what Mr Nosey would be like today? Would he be a hacker? Probably not, not that guessing passwords is actually all that hard considering people use pretty shocking passwords as it is, to the point that your financial institutions have to force you to have complex passwords (though there are some places that go to such an extreme that it is nigh impossible to actually get onto the site because they have so many layers of security you might as well not bother accessing the information). 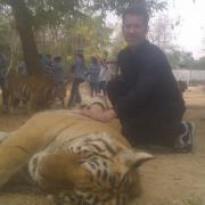 I seem to have gone off on a bit of a tangent, but then again I am probably quite well known for that. 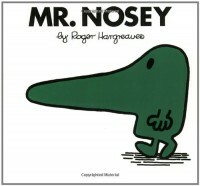 In any case Mr Nosey seems to be one of the earlier books because the later ones have many of the Mr Men making cameos, whereas with Mr Nosey you have our protagonist, who happens to be this green guy with a really big nose, while everybody else are just normal human beings who simply resent having Mr Nosey intrude into their lives. Actually, it isn't as if people live private lives in many parts of the world – this is a purely western phenomena where you ring before you go and visit somebody, or you even wait to be invited. In many places your friends simply rock up whenever, and everybody knows everybody else, and what everybody else does. In fact I'm sure we have all heard of the small town mentality where there are no secrets. Which makes me think that Mr Nosey actually lives in the city where pretty much what you do is nobody else's business, with the exception, of course, of the NSA, but then again it could quite well be that Mr Nosey was once an NSA agent, retired, but couldn't get the whole sticking his nose into other people's business out of his system, until the town got together and offered him some encouragement.